Merle Leufgen (*1991) is a software artist, curator and independent researcher. Merle co-hosts and co-curates ąяţǥąʍ€$ Berlin, a bi-monthly event that strives to foster the application of digital technologies such as 3D graphics software and game engines in artistic contexts. She employs videogame and web technology, computer graphics and various internet platforms. Her current work explores non-human intelligence, ecology and emergent behaviours. She lives and works in Berlin. Gabriel Helfenstein is a French transmedia artist and writer living in Berlin. His work ranges from experimental video games to hypertextual web-based fiction. He has curated several new media art festivals across Europe. His current work deals with the interactions between the organisations of neoliberal power and the human body. Troy Duguid (born 1990, Australia) is an artist working with game engines. Graduating from Queensland College of Art with a Bachelor of Animation with Honors, Troy’s early work were animated films, however as Troy discovered their work to be largely experienced online they found themselves dissatisfied with the replication of established analogue mediums. After graduating Troy began research into real-time graphics and interactivity for possibilities to create experiences accepting the unique characteristics and aesthetics of the digital medium, teaching themselves programming and computer graphics. 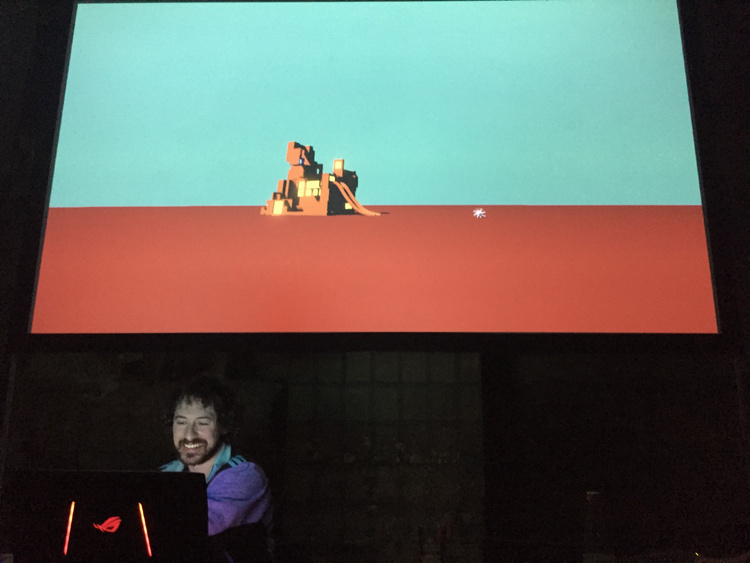 In late 2015 Troy began ąяţǥąʍ€$ (which they now co-host and co-curate), a bi-monthly event exploring computer graphics and videogames as performative real-time art. His current work explores synthesis of audio/visual/interface to create expressive systems, input transforming a user’s subconscious bias into a performative instrument. Software as a malleable language in which the artist, the user and the audience all take part. Troy has exhibited work in Berlin and Moscow. He currently lives in Berlin. Jessica Palmer is a Canadian living in Berlin. Her work ranges from interactive works created in game engines and performance software, to oil and watercolor paintings. Graduating from Sheridan Technical Institute, she has a degree in Illustration. She worked for 4 years as an illustrator and animator in Toronto, before changing course to interactive works using brainwave sensors, Unity Engine and TouchDesigner. She works in the experimental neurology department of Charité – Universitätsmedizin Berlin, creating neurogames & art installations controlled by the players' brainwaves. Jessica is inspired by neuroimaging technologies, brain computer interfaces, atmospheric horror games (no gore, plz), non-euclidean spaces, impossible collective experiences facilitated via technologies, internet grave digging, and doing no harm.